Healing Liver Cirrhosis: Look up ALL SIDE EFFECTS of ALL your Medications! Look up ALL SIDE EFFECTS of ALL your Medications! MAKE A LIST OF EVERY PRESCRIPTION YOU OR YOUR LOVED ONE IS ON, AND LOOK UP ALL OF THE SIDE EFFECTS! 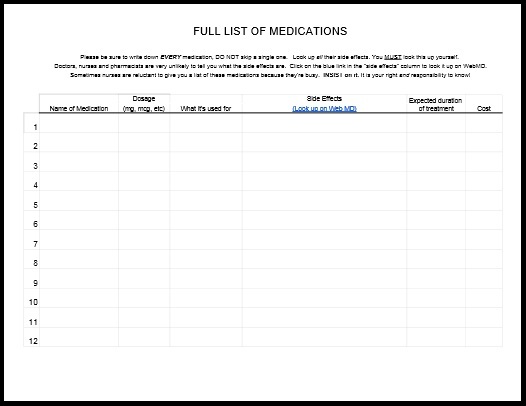 (If you scroll down, you will see a chart I created, that you can print out, and write down all your medications PLUS their side effects). (FYI if I sent you to this page via a link, and if you are looking for information on iron and calcium deficiency, you will find it at the bottom of this post... I may turn it into 2 separate posts but it's all on one page for now, because it relates to why you have to look up your meds, and this falls into the "what-doctors-don't-tell-you" category). What we learned, the hard way, is that it is FAR too easy to just overlook this important step... looking up all your medications! It's too easy to assume that doctors always know best, and that they are looking out for you every step of the way. NEVER EVER ASSUME THIS. It could cost you your LIFE!!! -Furosemide can cause kidney failure, diabetes, elevated bilirubin, calcium depletion and more (CLICK HERE to see a long list of side effects). -Antibiotics can cause full-blown LIVER FAILURE (this happened to him, too). That's just some of the side effects, people. The doctors and pharmacists will never, ever tell you what the side effects are, so you are going to need to look them up yourself!! This is why I believe it's important to turn things around ASAP. Don't let yourself get to the point where you are relying on these drugs to keep you alive, because they can, and probably will, eventually kill you! 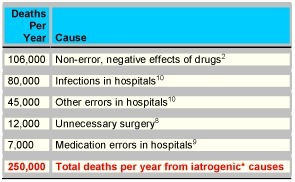 Iatrogenic (aka doctor-caused) disease is the #3 cause of death in the United States. And after what I've been through with my husband, and heard the stories from hundreds of people with cirrhosis... this does not surprise me ONE BIT! We had to learn the hard way, that even a simple medication prescribed by your dentist can cause liver failure if you have scar tissue in your liver! You can read more about the dangers of pharmaceutical drugs, in this post. I have yet to speak with one person who could tell me their doctor told them about the side effects of Proton Pump Inhibitors, which cause more scar tissue in the liver (you can learn more about that on THIS PAGE). My husband had to pay a dear price for the fact that we did not do this. I am not kidding guys. I really believe this mistake took years off my husband's life. We just assumed that if a medication was dangerous, then the doctors or pharmacist or nurse or SOMEBODY would tell us. I mean, there are so many people involved in getting a prescription... can't just ONE person stand up and say something about the dangerous side effects? Please do not EVER assume that your doctor, nurse, or pharmacist will tell you the side effects of the medications you're on. THEY WILL NOT. Ask me how I really feel about this topic, lol!! I cannot state this enough. It is ultimately your responsibility to look all of this stuff up, or bust out a magnifying glass and actually take a look at the fine print on that prescription paper they give you at the pharmacy. The side effects may or may not be listed. If they are not listed, it is YOUR JOB, more than anyone else's to find out what they are. You should also be aware of how long the doctor expects you to be on every medication. And you should find out if it causes inflammation or scar tissue. Inflammation tends to lead to scar tissue. If you see anything on the "side effects" list where there is some kind of warning for people who have liver disease, you need to know about that! That means it's not good for your liver, and it could be causing more scar tissue! 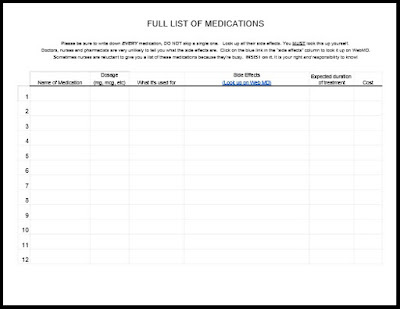 I created a simple form that you can use to write down all your medications (using Google Sheets), and their side effects. You can find it by CLICKING HERE. 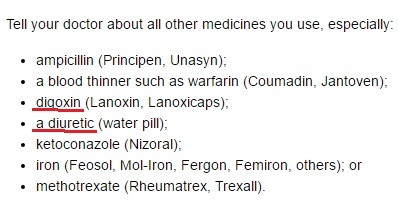 You'll see there will be a link to WebMD, where you can look up the side effects of all medications. 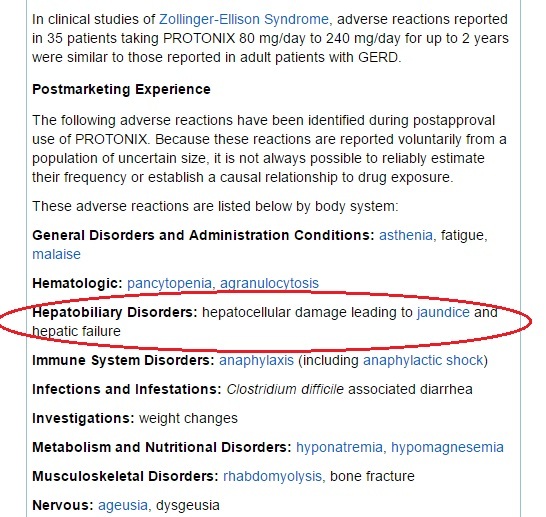 PLEASE SCROLL DOWN to ready why you may need to "expand the page" to see ALL the side effects. Sometimes just a little blurb is listed and you have to click on a box that says "see more" or "expand." Be sure to print it in "Landscape" mode (not portrait). You can also print out a PDF. If you have cirrhosis, I recommend you scan the list of side effects for the word "hepatic" and "hepato" (to see if there is a warning for people with liver disease). If you scan for the word "liver" you may not find much, but if you see "hepatic failure"... I probably don't have to tell you, this means LIVER FAILURE. You can use this easy shortcut to find keywords on a page. Hit the CTRL button plus the "F" key at the same time, and a search box will come up. Type in the word, then hit "enter." 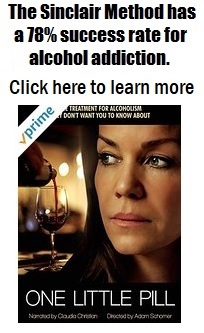 You can also google the name of the medication plus side effects liver, to see what comes up. But DO NOT just assume that what pops up as the first entry is the whole enchilada. You have to look at the LONG PAGE OF SIDE EFFECTS to get the big picture. It would be easy for me to read this little blurb that comes up in google, below, and think this is all you have to worry about. I can imagine a lot of people going, "B12 deficiency? Oh well, I can live with that." And not clicking any further. People.... this is just about ONE PERCENT of the potential side effects!! It's just the little short blurb they list on Google! You have to keep reading! I've been researching this liver stuff for THREE YEARS and am still learning about the dangerous side effects of some of these medications my husband was on. And I do more research than the average person, so imagine there are a lot of people who don't know about these side effects, just like I didn't. I thought, that's weird. Why would they put diuretics on there? I had long considered those to be one of the safer meds my husband was on (although I knew they can cause dehydration, and also hair loss if taken for too long). My husband had also been on Digoxin for years. FYI I didn't underline Iron in red, but my husband was diagnosed with low ferritin (iron) when he was on PPI's. If you read the rest of this post you will see why (I believe) iron is on this list also. Needless to say, since we never saw this, we never brought this up with his doctor, so we were completely unaware of the fact that my husband was taking a dangerous combination of drugs. We just kind of assumed that his Gastroenterologist was in charge of everything. And besides, he was the one who gave him BOTH the diuretics, AND the pantoprazole.... so shouldn't the doctor be the one to bring it up? Sadly, that's not how it works. If you don't ask, they don't tell. Unbeknownst to us, my husband was on SEVERAL calcium-depleting drugs at the same time. I already knew Pantoprazole depleted calcium (well... we found out after he'd already been taking it for 9 months). But I didn't even know, until tonight (while I was doing research for this post), that Digoxin (which he was taking for his heart) and Lasix (one of two diuretics he was taking) ALSO deplete calcium! And a cirrhotic liver already makes a person extremely calcium deficient, so taking THREE things that are known to deplete calcium was just a recipe for disaster. It's no wonder he suffered from severe bone loss! When I'd think of "dangerous drug combinations" it never occurred to me that the reason they can be dangerous is that they can create not just a deficiency.... but an extreme deficiency, which can have serious long term effects. I found the following info on this informative guide. Spironolactone (potassium-sparing diurectic) DEPLETES folic acid and sodium. AVOID the following herbs which may cause undesirable interactions: buchu, cleavers, dandelion, gravel root, horsetail, juniper, and uva ursi. Avoid taking potassium supplements (or using potassium-based salts) while using this drug. I've talked to many people with cirrhosis who have very low hemoglobin/iron levels and are trying to raise them. I tend to be iron deficient, and my Mom and sisters are, too. So I have had to learn how to increase my own iron levels, over the years. I donate blood regularly, and it is actually a good way to see where my iron levels are at. I only learned last week, when I failed yet another hemoglobin check, that CALCIUM DEPLETES IRON LEVELS! That was about the 5th time I've failed my hemoglobin check before attempting to donate blood. It was only after my last FAIL (last week) that the woman who tested my blood, informed me that calcium depletes iron levels. I had no idea. I've been taking a LOT of calcium in the last 9 months, since I've been trying to heal a cracked tooth... so it doesn't surprise me that I've failed my hemoglobin test so many times in the last 9 months! I never fail if I'm taking my Visalus Vitamins regularly, but I ran out, and even spinach shakes combined with Vitamin C (which helps iron absorption) couldn't bring my levels up high enough to donate (your hemoglobin has to be 12.5). A good friend gave me some stuff called Hemaplex that enabled me to pass, easily, but I ran out of that too. So I have just been taking a bunch of my own supplements... which didn't work, either. If you do take iron supplements to raise your hemoglobin, please be sure you don't overdo it. I've overdosed on iron three times in my life and two of those times I was SO NAUSEOUS, and the time I accidentally overdosed on Hemaplex (forgetting you're supposed to take one a day for 5 days, not five at once), I started to "white out" (like a blackout but everything was turning white). I started glugging the water I keep talking about, and within a minute, my eyesight went back to normal. The other two times I got sick, it was just from taking two Geritol supplements (in addition to taking other supplements that may have had iron also). That's what I get for waiting till the last minute to try to raise my iron levels, in order to donate! Calcium makes it harder for your body to absorb either supplemental iron or iron from food, according to the National Institutes of Health. Calcium competes for absorption with iron in your intestines and reduces its uptake. This means that a multi-mineral supplement is likely not the best way of getting iron due to the negating effects of the calcium and some other minerals. Instead, eat iron-rich foods -- preferably without calcium-rich dairy products -- or take iron supplements separately from other minerals. Another rich source of calcium that can negatively impact iron absorption is antacid tablets, commonly taken for heartburn but also as an inexpensive calcium supplement to help prevent osteoporosis. So, yeah.. just be sure to take the iron SEPARATELY from the calcium, and hopefully this will solve the problem. I guess I will find out if it works, the next time I try to donate blood! I've heard that some calcium supplements are better-absorbed than others, so I've spent a lot of time looking up reviews of different brands on Amazon. A few years ago I was reading about Algae-Cal, which is supposedly absorbed better than regular calcium, but it's on the pricey side. But if it really does prevent osteoporosis... I don't care if it was 100 bucks a bottle, it'd be worth it. So I am listing that, plus some other alternatives. My husband's liver specialist told him to take Citracal but he hated that the pills were so big and didn't take them as regularly as he should have. It is crazy to think of what an costly oversight that could be (I still don't know how much Citracal would have helped him, but it does have good reviews on Amazon, and I just saw they make pills that are smaller!) So here is a list of the different ones you may want to look into. Just be sure you take it SEPARATELY from the iron! You can see more information on the AlgaeCal site... they have some really good videos. They even give a "double your money back" guarantee! (I have bought this for my husband in the past, and put in his shakes, but now I realize that probably wasn't the smartest thing because they were spinach shakes so the calcium was probably cancelling out the iron he'd be getting from the spinach)! So I will have to make him a separate shake, maybe one with fruit, in the evenings. I don't want him to stop drinking the spinach shakes! When I looked this up a while back on Amazon, I couldn't help notice the good reviews it had. It was a little more pricey than some of the others, but I still plan to buy it at some point. I have not tried this one, I'm just listing it because it seems affordable, had good reviews, and I like it that it has Vitamin K2, in addition to D3 and magnesium. Plus, they're "slim tabs"! So maybe my husband would actually take them! I bought this type for myself, from whole foods, when I found I had a tooth abscess. The woman working there told me a lot of people bought it to rise their mouths to re-grow their teeth! It really does seem to work, and the taste isn't too bad, so I am sharing this too. Jake's doctor recommended Citracal. Although my husband didn't take it as regularly as he should have (because he hated the large pills) I did see that they make a "petite" pill now. It just kills me how that one minor issue kept him from taking something that could really have helped him. I was surprised by how many good reviews there are for this, so I am putting it on this page as well. Please people, DO NOT overlook the importance of getting enough calcium if you have cirrhosis. I wish we could go back in time and take one of these supplements, but we can't, so I just hope you can learn from our mistakes!